HOUSTON, TX--(Marketwire - December 23, 2008) - Frontera Resources Corporation (London Stock Exchange, AIM Market - Symbol: FRR; OTCQX Market, U.S.A. - Symbol: FRTE), an independent oil and gas exploration and production company, today announced the recent commencement of the Mirzaani #2 well at the Mirzaani Field in its Shallow Fields Production Unit, Block 12, in the country of Georgia. Drilling operations commenced on December 17 at the Mirzaani #2 well, the first well in a new drilling campaign that is focused on opening up an underdeveloped portion of the Mirzaani Field that was identified in a field study conducted earlier this year. The well will test reservoirs in an up dip position from existing production as well as undrilled deeper horizons in an area situated in the northwestern portion of the field. Frontera estimates this area to contain potentially significant volumes of recoverable oil reserves, and initial drilling will seek to not only increase production, but also to improve understanding of the potentially extensive prospectivity associated with this portion of the field. The Mirzaani #2 is the first new well to be drilled in the field since 1972 and will take approximately two weeks to reach a total depth of 1,100 meters. It is expected to encounter multiple hydrocarbon bearing zones in the Lower Pliocene age Shiraki formation between depths of 500 meters and 1,100 meters. Production testing will follow the completion of the well and is expected to establish the basis for continuous drilling operations in 2009. Discovered in 1932, the field has historically produced approximately 7 million barrels of oil, but contains many undrilled locations across the structure. In 2006, Frontera acquired approximately 100 kilometers of new seismic data over the field area as part of an effort to identify new potential. Work is currently ongoing to update reserve estimates and results from the Mirzaani #2 well will contribute to this new assessment. "The drilling of the Mirzaani #2 well at the Mirzaani Field marks another important milestone in the continued growth of the Shallow Fields Production Unit. If successful, we believe the well will establish the basis for an important new extension to the existing field. We expect the low-cost nature of operations within this business unit to contribute to realizing significant near-term value creation for our shareholders in 2009." Frontera's Shallow Fields Production Unit is located in the central portion of Block 12 and represents what the company believes to be an extensive trend of low-cost, low-risk undeveloped oil and gas reserves. Containing four discovered yet undeveloped or underdeveloped fields that have additional exploration potential, objectives are considered to be traditional, well-known reservoirs of Pliocene and Miocene age that are situated at depths from 10 meters to 1,500 meters. 2. Gerard Bono, Frontera's Vice President and Chief Reservoir Engineer, is the qualified person who reviewed and approved the reserve information contained in this announcement. 3. 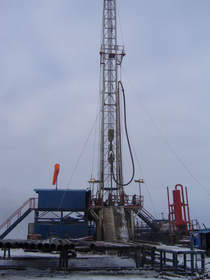 This release contains certain forward-looking statements, which may include, without limitation, expectations, beliefs, plans and objectives regarding potential transactions or ventures, potential drilling schedule, reserves and well performance, as well as future drilling, development and production. Among the important factors that could cause actual results to differ materially from those indicated by such forward-looking statements are: exploration and development results; availability and performance of needed equipment and personnel; seismic data; evaluation of logs and cores from wells drilled; fluctuations in oil and gas prices; weather conditions; general economic conditions; the political situation in Georgia and neighboring countries; and other factors listed in Frontera's financial reports, which are available at www.fronteraresources.com/Investors.php?link_id=23. There is no assurance that Frontera's expectations will be realized, and actual results may differ materially from those expressed in the forward-looking statements.